The holidays will be coming to an end for this year and guess what? We will sorely miss it! This year we embarked on not one but two holidays back to back. Looking back,it was a little insane to do especially since we did something similar a year back. Given that 2014 was a challenging year for us, we decided to forge ahead as a little reward. This was also a good time to rejuvenate and be recharged for the year ahead. The first trip was an extended family trip to Phuket , where the agenda is to explore the hidden treasures of the island for kids. 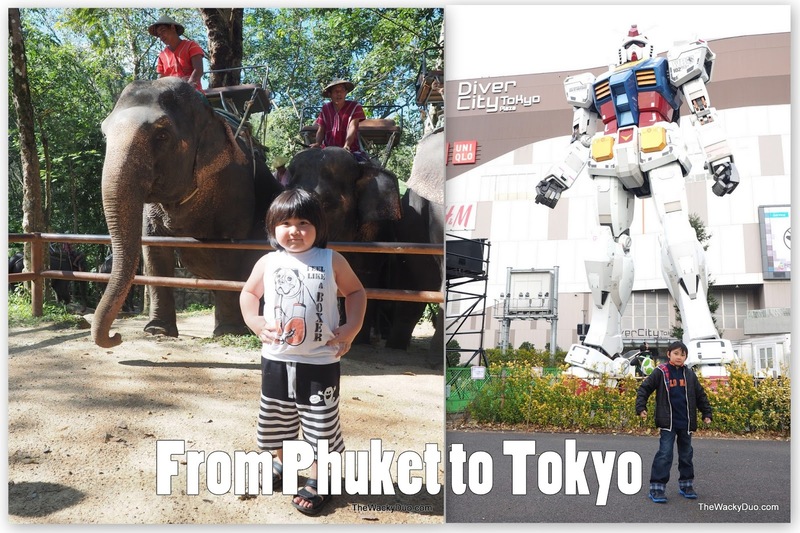 It was our task to find out if Phuket, a beach oasis, can be magical for children too. There we set sail for island hopping and ride on elephants . Our home for one week was the Bell Pool Villa Resort in Kamala. The trip was also meant to be laid back and to enjoy our extended family's company. We are glad that we achieved it on both counts. The second trip is a family trip to Tokyo with just the four of us. We are no strangers to Tokyo as this is our 4th consecutive year into the City. The main draw would be Disneyland and Disneysea. After 4 years, we can finally say we had explored the parks. The past visits was a little tough as the boys were a tad too small to enjoy the rides and could not last more than 6 hours per trip. This time round , it was rides galore. We average 12 rides per Disney visit setting many first experiences for everyone. Time spend there was doubled with 12 hours dedicated to both parks on on days. If you have ever been to Tokyo Disneyland, you would know that this is an achievement given the perpetual crowd there. In addition to the usual Disney fares, we took a chance to explore Uneo. This is where the zoo, museums and shrines are found in one location. This visit was always a part of our agenda for our previous visits, but it was often thwarted by bad weather. This time round, the sky has been exceptionally kind to us. Since we are in Tokyo, a city known for its quirkiness, indulging in a local's past time - UFO Catching or Claw Catching, is high on our list. For a Dad who was obsessed since our first trip to Tokyo in 2010, my UFO Catching skills had improved much since then. If you have been following our instagram, you would probably notice our *ahem* impressive haul. Since we love to share, we will throw in a few tips on UFO catching in the coming weeks. It was an awesome 2 weeks spend in 2 totally different cultures and experiences. The transition from a Sunny Island to a Chilly City with near 0 Degree temperature was also a welcome respite from the gloomy weather at home. Bookmark us as we unveil our adventures over a series of Travel series in the next coming weeks.